Please click for a video about how Vibram shoes should fit. Vibram FiveFingers footwear is designed around the foot~s measurement in inches. There is no real 100 percent translation between your US size and FiveFingers size. In order to find the right size, please measure both feet from heel to tip of longest toe with a ruler in inches. Take the longest measurement of your longest foot and refer to our to find your shoe size. The classics are always in style! Join the minimalist running shoe movement with the Vibram FiveFingers Classic. Each toe pocket separates and strengthens toes while improving balance, agility and range of motion. Lightweight and stretchy polyester fabric upper. Antimicrobial microfiber footbed. Vibram TC-1 performance rubber outsole delivers an excellent ground feel while providing abrasion-resistant protection. Machine wash, air dry. Imported. Measurements: Weight: 5 oz Product measurements were taken using size 37 (US Women~s 6.5), width B - Medium. Please note that measurements may vary by size. Weight of footwear is based on a single item, not a pair. Please click for a video about how Vibram shoes should fit. 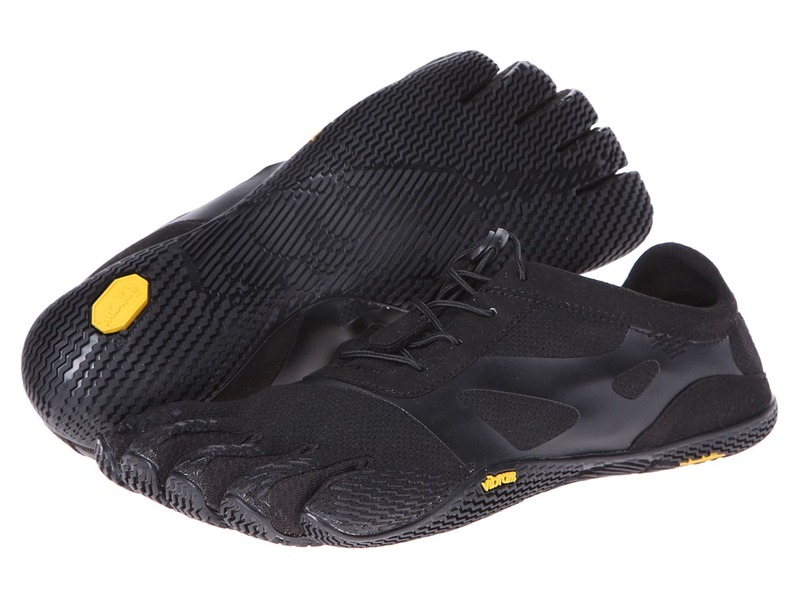 Vibram FiveFingers footwear is designed around the foot~s measurement in inches. There is no real 100 percent translation between your US size and FiveFingers size. In order to find the right size, please measure both feet from heel to tip of longest toe with a ruler in inches. Take the longest measurement of your longest foot and refer to our to find your shoe size. Enjoy the feeling of nothing but the earth underfoot with the EL-X from Vibram FiveFingers. Built specifically to promote a barefoot-like experience. Ideal for fitness and casual wear. Breathable polyester mesh upper. Coconut Active Carbon fabric and PU overlays heighten durability without sacrificing flexibility. Upper envelopes the foot to help keep debris out. 2mm, microfiber footbed with Dri-Lex antimicrobial technology for a great in-shoe environment. 2mm EVA midsole offers light underfoot protection. 2.7mm Vibram TC-1 Performance rubber provides exceptional underfoot feel without compromising abrasion resistance. Serrated blade tread pattern delivers flexibility and reliable traction on wet surfaces. Imported. Measurements: Weight: 4 oz Product measurements were taken using size 43 (US Men~s 9.5-10), width D - Medium. Please note that measurements may vary by size. Weight of footwear is based on a single item, not a pair. Please click for a video about how Vibram shoes should fit. Vibram FiveFingers footwear is designed around the foot~s measurement in inches. There is no real 100 percent translation between your US size and FiveFingers size. In order to find the right size, please measure both feet from heel to tip of longest toe with a ruler in inches. Take the longest measurement of your longest foot and refer to our to find your shoe size. From kayaking, surfing, or walking on the rocky beach, the Signa from Vibram FiveFinger will be clutch in your time of adventure! Built specifically to promote a barefoot-like experience. Ideal for watersports. Breathable stretch polyester mesh upper. Upper envelopes the foot to help keep debris out. Split sole design allows for natural plantar flexion increasing efficiency when swimming. Hook and loop strap for a custom, snug fit. Abrasion resistance fabric for durability and foot protection. Small perforates in sole for water drainage, minimizes weight and speeds up drying time. 3mm midsole provides plating protection to prevent stone bruising. Vibram performance rubber for added slip resistance on rocks. Machine washable. Air dry. Imported. Measurements: Weight: 4 oz Product measurements were taken using size 45 (US Men~s 11-11.5), width D - Medium. Please note that measurements may vary by size. Weight of footwear is based on a single item, not a pair. Please click for a video about how Vibram shoes should fit. 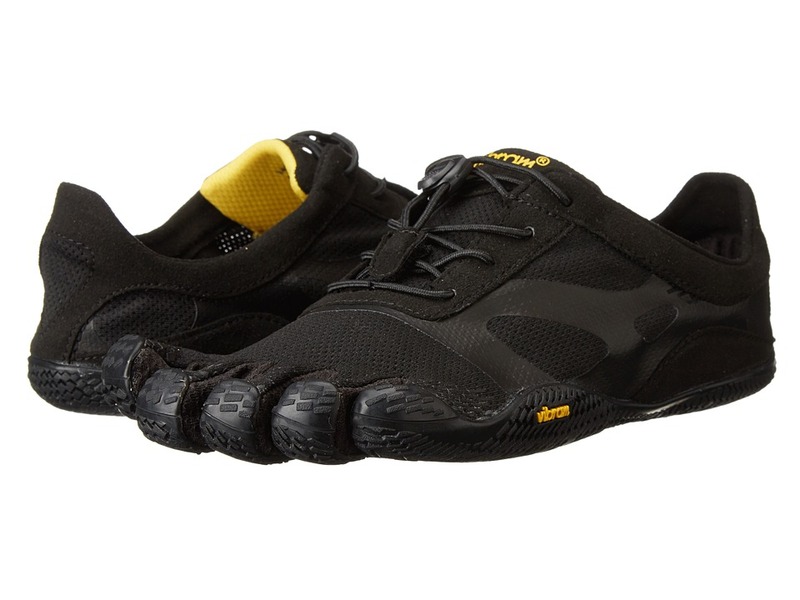 Vibram FiveFingers footwear is designed around the foot~s measurement in inches. There is no real 100 percent translation between your US size and FiveFingers size. In order to find the right size, please measure both feet from heel to tip of longest toe with a ruler in inches. Take the longest measurement of your longest foot and refer to our to find your shoe size. Where will your day take you? On trail? Through the bustling city streets? Perhaps over your favorite running path? Wherever it leads you, trek freely in the adventure-bound versatility of the KSO from Vibram FiveFingers. Built specifically to promote a barefoot-like experience. Ideal for running, fitness, water sports, yoga and pilates, on- and off-road adventures, as well as everyday casual wear. Fit Tips: 1. Insert foot, slipping each toe into the individual toe pockets. It may work best to begin with the big toe. 2. After each toe is in place, slip heel in and adjust until it is snuggly in place. 3. Secure the strap, making sure it lies flat across top of foot. Wiggle toes and adjust strap until you find the ideal fit. Thin, abrasion-resistant stretch polyamide and breathable mesh upper materials. Upper envelopes the foot to help keep debris out. Individual toe pockets promote muscle strengthening in the feet and lower legs, as well as improve balance, agility and range of motion. Adjustable, hook-and-loop Hypalon strap wraps the top of foot through the heel for a secure fit. Heel pull loop for an easier on and off. 2mm, antimicrobial, microfiber footbed offers light underfoot cushioning. Non-marking, 3.5mm Vibram TC-1 Performance rubber provides exceptional underfoot feel without compromising abrasion resistance. Durable outsole design helps protect feet from hot surfaces and rugged terrain, while thin razor-sipping heightens flexibility and slip resistance over wet and dry surfaces. Imported. Measurements: Weight: 6 oz Product measurements were taken using size 43 (US Men~s 9.5-10), width D - Medium. Please note that measurements may vary by size. Weight of footwear is based on a single item, not a pair. Please click for a video about how Vibram shoes should fit. 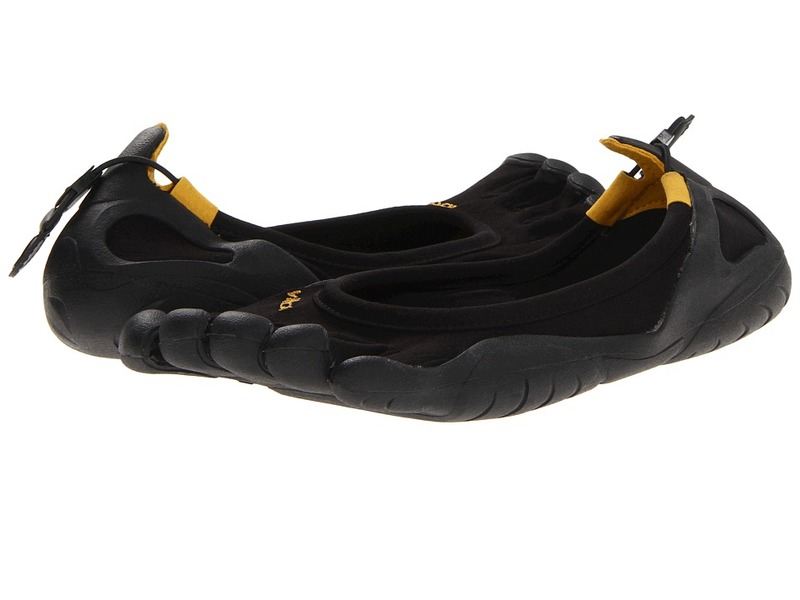 Vibram FiveFingers footwear is designed around the foot~s measurement in inches. There is no real 100 percent translation between your US size and FiveFingers size. In order to find the right size, please measure both feet from heel to tip of longest toe with a ruler in inches. Take the longest measurement of your longest foot and refer to our to find your shoe size. Where will your day take you? On trail? Through the bustling city streets? Perhaps over your favorite running path? Wherever it leads you, trek freely in the adventure-bound versatility of the KSO from Vibram FiveFingers. Built specifically to promote a barefoot-like experience. Ideal for running, fitness, water sports, yoga and pilates, on- and off-road adventures, as well as everyday casual wear. Fit Tips: 1. Insert foot, slipping each toe into the individual toe pockets. It may work best to begin with the big toe. 2. After each toe is in place, slip heel in and adjust until it is snuggly in place. 3. Secure the strap, making sure it lies flat across top of foot. Wiggle toes and adjust strap until you find the ideal fit. Thin, abrasion-resistant stretch polyamide and breathable mesh upper materials. Upper envelopes the foot to help keep debris out. Individual toe pockets promote muscle strengthening in the feet and lower legs, as well as improve balance, agility and range of motion. Adjustable, hook-and-loop Hypalon strap wraps the top of foot through the heel for a secure fit. Heel pull loop for an easier on and off. 2mm, antimicrobial, microfiber footbed offers light underfoot cushioning. Non-marking, 3.5mm Vibram TC-1 Performance rubber provides exceptional underfoot feel without compromising abrasion resistance. Durable outsole design helps protect feet from hot surfaces and rugged terrain, while thin razor-sipping heightens flexibility and slip resistance over wet and dry surfaces. Imported. Measurements: Weight: 5 oz Product measurements were taken using size 40 (US Women~s 9), width B - Medium. Please note that measurements may vary by size. Weight of footwear is based on a single item, not a pair. Please click for a video about how Vibram shoes should fit. Vibram FiveFingers footwear is designed around the foot~s measurement in inches. There is no real 100 percent translation between your US size and FiveFingers size. In order to find the right size, please measure both feet from heel to tip of longest toe with a ruler in inches. Take the longest measurement of your longest foot and refer to our to find your shoe size. The classics are always in style! Join the minimalist running shoe movement with the Vibram FiveFingers Classic. Each toe pocket separates and strengthens toes while improving balance, agility and range of motion. Lightweight and stretchy polyester fabric upper. Antimicrobial microfiber footbed. Vibram TC-1 performance rubber outsole delivers an excellent ground feel while providing abrasion-resistant protection. Machine wash, air dry. Imported. Measurements: Weight: 7 oz Product measurements were taken using size 45 (US Men~s 11-11.5), width D - Medium. Please note that measurements may vary by size. Weight of footwear is based on a single item, not a pair. Please click for a video about how Vibram shoes should fit. 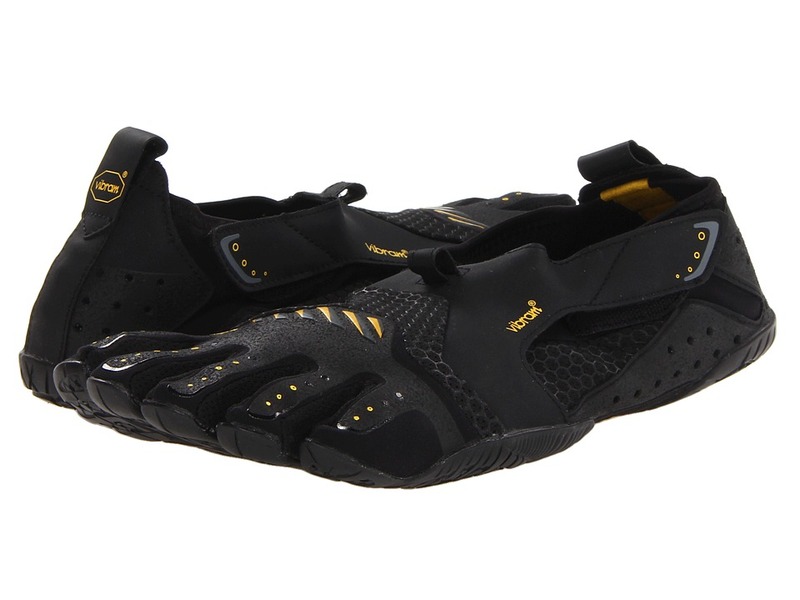 Vibram FiveFingers footwear is designed around the foot~s measurement in inches. There is no real 100 percent translation between your US size and FiveFingers size. In order to find the right size, please measure both feet from heel to tip of longest toe with a ruler in inches. Take the longest measurement of your longest foot and refer to our to find your shoe size. Looking to be closer to nature? 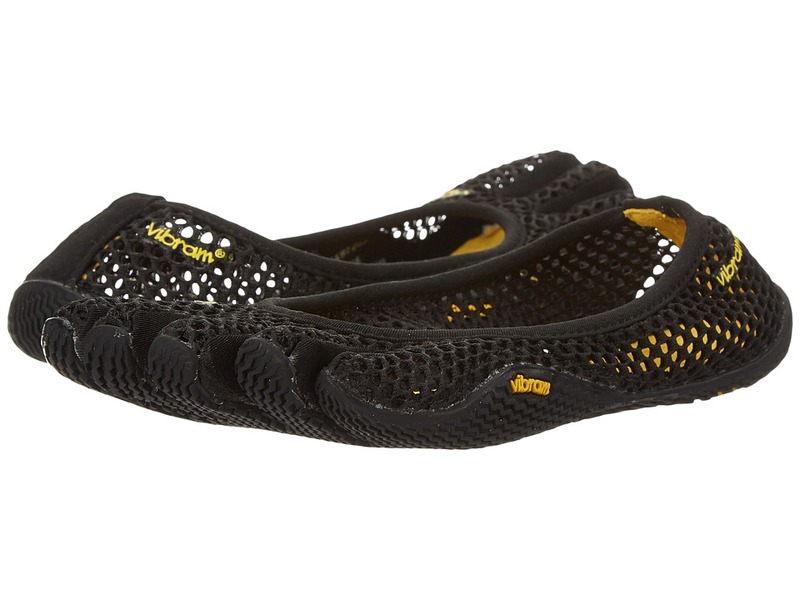 Get the minimal feel you crave by slipping into the KSO EVO from Vibram FiveFinger. Built to provide the best ground feedback. Polyester mesh and textile upper materials. Bungee speed lacing system allows for easy on and off, and a snug fit. Soft lining offers a great next-to-skin feel. Lightly padded, 2 mm EVA insole features antimicrobial properties for a fresher in-shoe fee. Max Outsole Thickness: 4.7 mm Vibram outsole delivers reliable traction over a variety of surfaces. Imported. Measurements: Weight: 4 oz Product measurements were taken using size 38 (US Men~s 6.5-7), width D - Medium. Please note that measurements may vary by size. Weight of footwear is based on a single item, not a pair. Please click for a video about how Vibram shoes should fit. 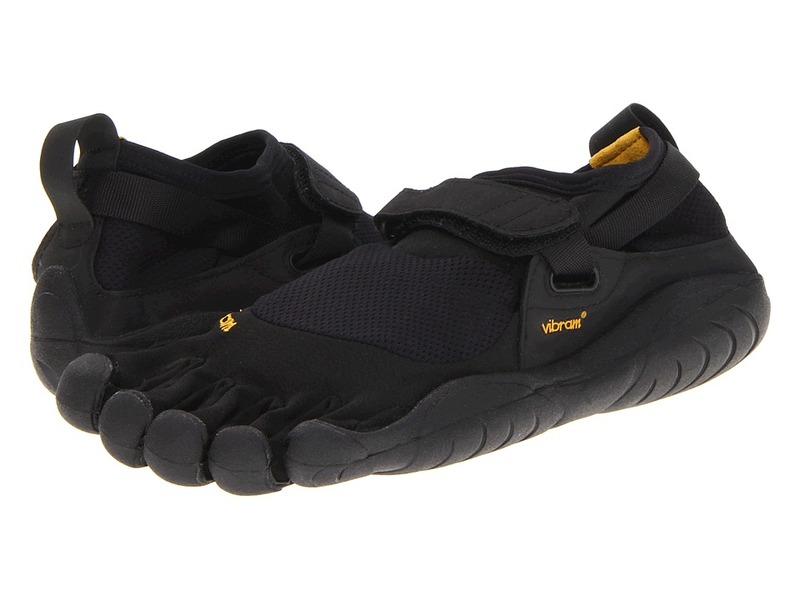 Vibram FiveFingers footwear is designed around the foot~s measurement in inches. There is no real 100 percent translation between your US size and FiveFingers size. In order to find the right size, please measure both feet from heel to tip of longest toe with a ruler in inches. Take the longest measurement of your longest foot and refer to our to find your shoe size. Looking to be closer to nature? 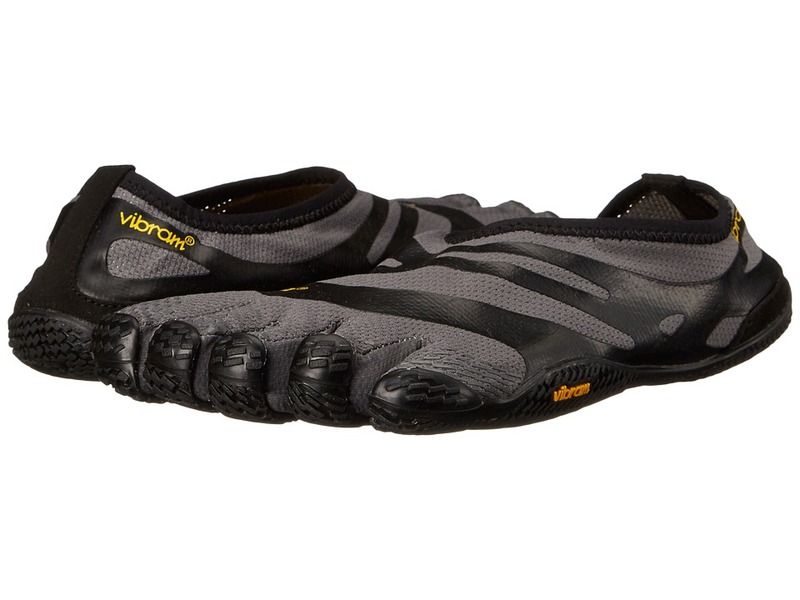 Get the minimal feel you crave by slipping into the KSO EVO from Vibram FiveFinger. Built to provide the best ground feedback. Polyester mesh and textile upper materials. Bungee speed lacing system allows for easy on and off, and a snug fit. Soft lining offers a great next-to-skin feel. Lightly padded, 2 mm EVA insole features antimicrobial properties for a fresher in-shoe fee. Max Outsole Thickness: 4.7 mm Vibram outsole delivers reliable traction over a variety of surfaces. Imported. Measurements: Weight: 5 oz Product measurements were taken using size 41 (US Women~s 9-9.5), width B - Medium. Please note that measurements may vary by size. Weight of footwear is based on a single item, not a pair. Please click for a video about how Vibram shoes should fit. 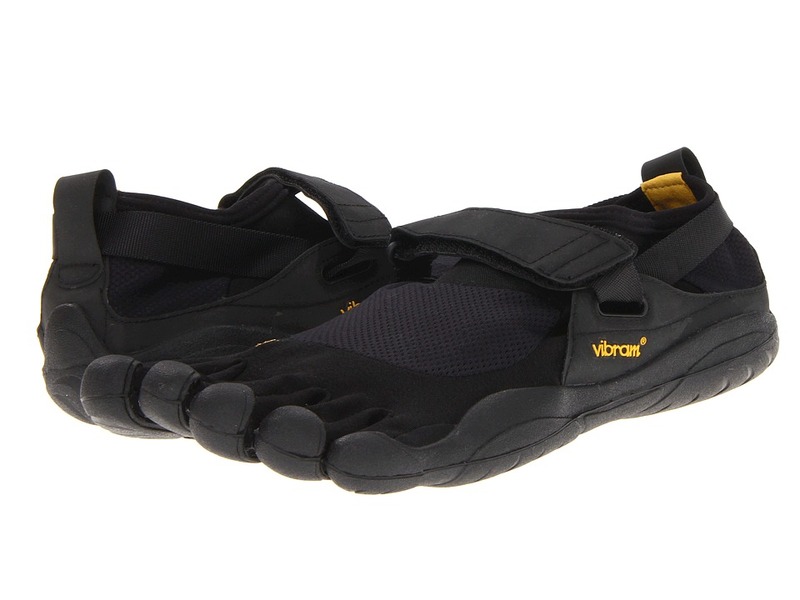 Vibram FiveFingers footwear is designed around the foot~s measurement in inches. There is no real 100 percent translation between your US size and FiveFingers size. In order to find the right size, please measure both feet from heel to tip of longest toe with a ruler in inches. Take the longest measurement of your longest foot and refer to our to find your shoe size. 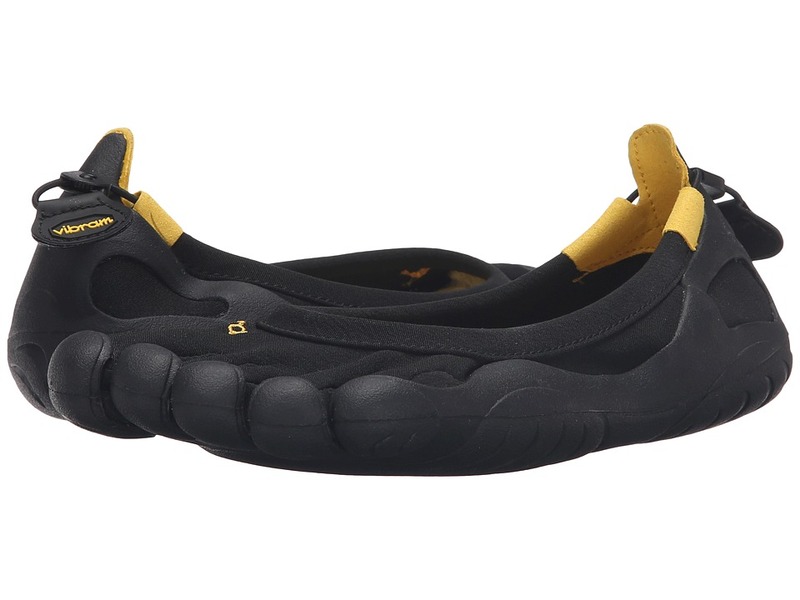 Slip into something a little more comfortable with the cute Vi-B flat from Vibram FiveFingers. Fit Tips: 1. Insert foot, slipping each toe into the individual toe pockets. It may work best to begin with the big toe. 2. After each toe is in place, slip heel in and adjust until it is snuggly in place. Highly breathable polyester mesh upper materials. Easy slip-on style. Soft foam insole features antimicrobial Drilex technology to keep feet feeling fresher for longer. Max Outsole Thickness: 3.5 mm Vibram outsole delivers reliable traction over a variety of surfaces. Imported. Measurements: Weight: 3 oz Product measurements were taken using size 38 (US Women~s 7), width B - Medium. Please note that measurements may vary by size. Weight of footwear is based on a single item, not a pair.